Kathy Antaya and Maria Moreno-Reyes live in two different cities in two different parts of Michigan. They probably don’t even know one another. But what they share is ingenuity, strength, and a mission to give added purpose to existing land in their own communities. In Battle Creek and Grand Rapids, Antaya and Moreno-Reyes are farming land and growing healthy, culturally-significant produce. But they’re also looking to the future by experimenting with sustainability to keep their gardens viable for years to come. 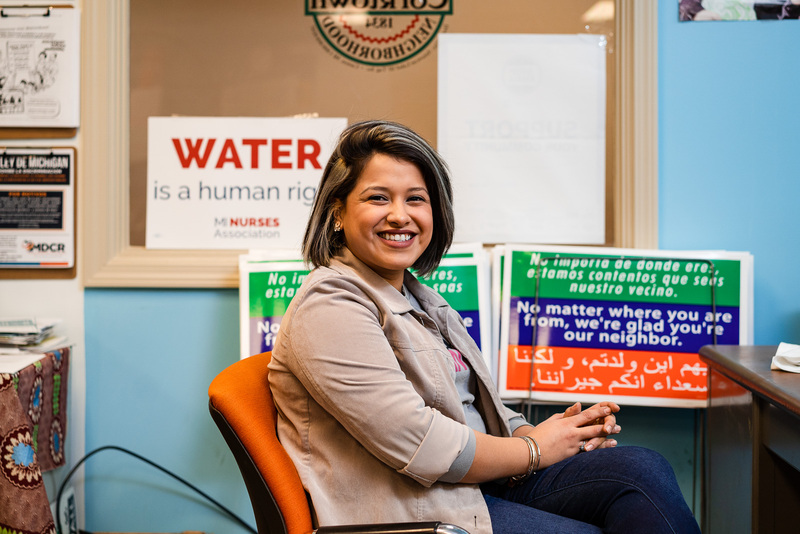 It was five years ago when Moreno-Reyes broke ground with a few of her neighbors on a disused plot in her Roosevelt Park neighborhood in Grand Rapids. She was inspired after attending a conference in Muskegon for the Neighborhood Associations of Michigan, where she learned how people were beautifying spaces in creative ways. A portion of the garden is dedicated to community gathering and relaxation. 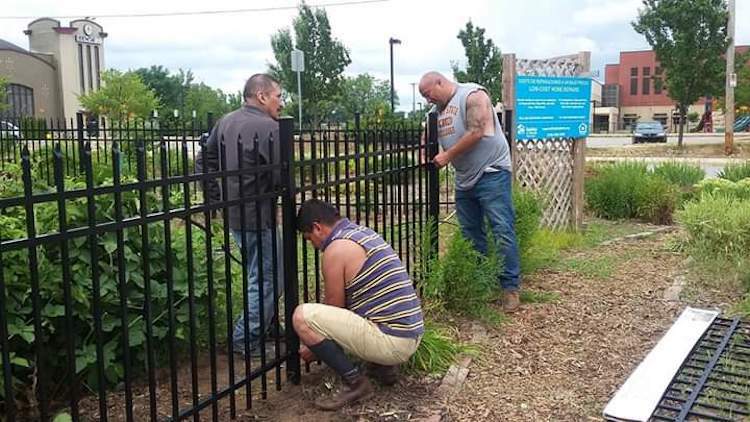 Sweat equity matched a grant to build a fence around the Roosevelt Park Community Garden. Photo by M. Moreno-Reyes. The plan started to take hold, and pretty soon, neighbors were tilling and fertilizing, growing crops that made sense to them. “Maybe eight families got together and rented from Habitat a 3 by 20 foot space for $5. We were able to grow peppers and tomatoes,” says Moreno-Reyes. 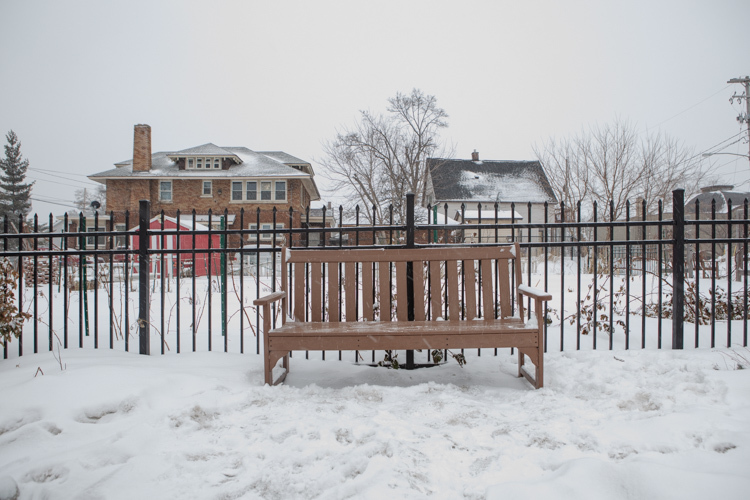 Eventually the neighbors pieced together a short fence and dubbed the space Roosevelt Park Community Garden. “We started thinking about what our garden needed. We were tilling and preparing and utilizing every resource possible,” says Moreno-Reyes. Recognizing the need for sprinklers, garden hose, and seedlings, Moreno-Reyes applied for a Neighborhood Match Fund grant through the City of Grand Rapids and was awarded $2,500, the maximum grant, which they used to fund a fence, with help from Habitat, donated materials from Outback, and the generosity of those with fence-building skills. The crops grown help the dozen or so families connect to their own ethnic identities, says Moreno-Reyes. 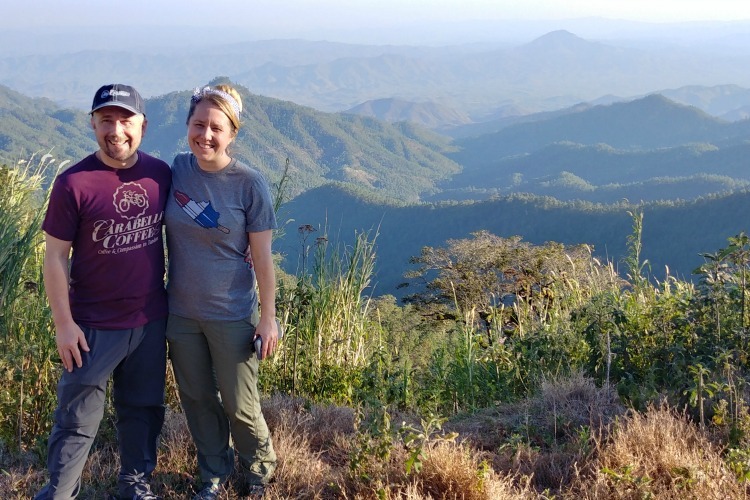 “We have two Puerto Rican families, an African American family, three Anglo families, and the rest are Guatemalan,” says Moreno-Reyes, who is Mexican and her husband, Victor, is Guatemalan. From purple beans, to banana peppers, to cilantro, onions, potatoes, and bell peppers, tomatoes, pinto beans, and tomatillos, neighbors are growing what they enjoy eating — and they’re testing their farming skills with ethnic speciality crops. “I went to Guatemala and was taken right back to my grandmother’s era. Purple corn and black beans were huge, and I was geeked at seeing the corn,” says Moreno-Reyes, adding that purple corn, central to her Mayan ancestry, is proving difficult to grow. 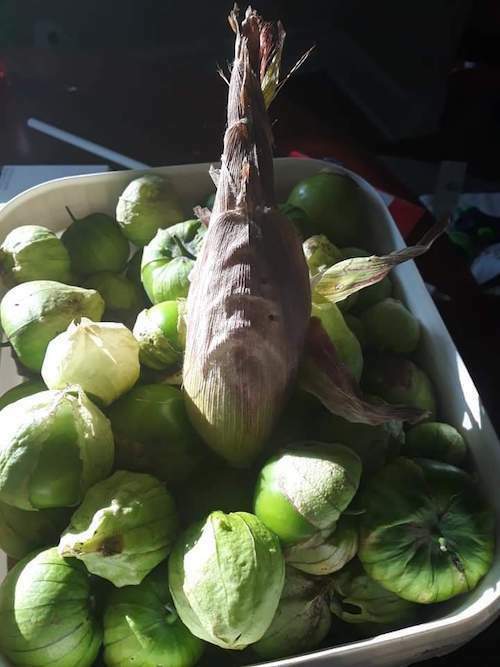 Purple corn and tomatillos are among the produce Maria Moreno-Reyes grows. Photo by M. Moreno-Reyes. To create sustainability, neighbors have this year agreed to sell all excess produce at the Cesar E. Chavez Farmers Market in Roosevelt Park. “And that profit goes to the garden to pay for our water. Habitat pays for it now. We will make the garden self-sufficient some day,” says Moreno-Reyes. Each crop is visible evidence of the neighbors’ collective efforts. What’s less visible, but just as important, are the skills they are gaining through accountability. “These are different pathways for taking on that responsibility. Looking at prices, getting quotes, making calls and talking to those they normally wouldn’t. This is a way for them to practice their English, but also to figure how many bricks are needed for a project. This is all helping them step out of their norm,” Ledesma says. 65 miles away, Kathy Antaya is transforming existing green space in Battle Creek into an urban farm that grows produce from the everyday to the esoteric. She’s helping the farm establish sustainability, and challenging herself to set down her hoe and spread the word about 365 Urban Farm at Leila Arboretum. 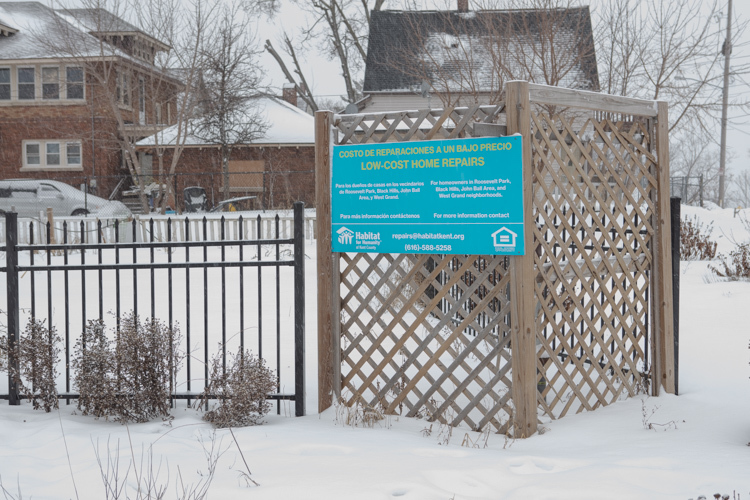 The Gardening 365 program includes community garden beds taken under the wing of the significant Burmese refugee population in Battle Creek, several outdoor plots, and, true to the 365 in the name, a couple of hoophouses. The program’s mission is three-fold: to attract people to the arboretum to visit the farm stand and tour the property, to help people--especially children--understand how plants impact our daily lives, and to support the community garden to ease food insecurity that exists in the neighborhoods that surround the 85-acre space, named for Leila Post Montgomery, wife of C.W. Post of cereal fame, who donated the land to Battle Creek in 1922. “We do not advertise widely, but we do so closely,” says Antaya, referring to signs scattered around the property and at schools and churches. The reason is simple. Antaya wants the produce to go to neighbors who need it most. “I’d rather those who have a car, money, and access to go downtown to our farmstand.” The arboretum market accepts EBT, WIC Project FRESH, and Senior Project FRESH. Antaya wants families with income challenges to recognize that the farmstand prices are lower than the supermarket, and there is less waste because “even ugly vegetables deserve to be eaten,” she says. “We don’t discard what a lot of farms would consider seconds.” Leftover produce is donated to Haven of Rest or to local food pantries. 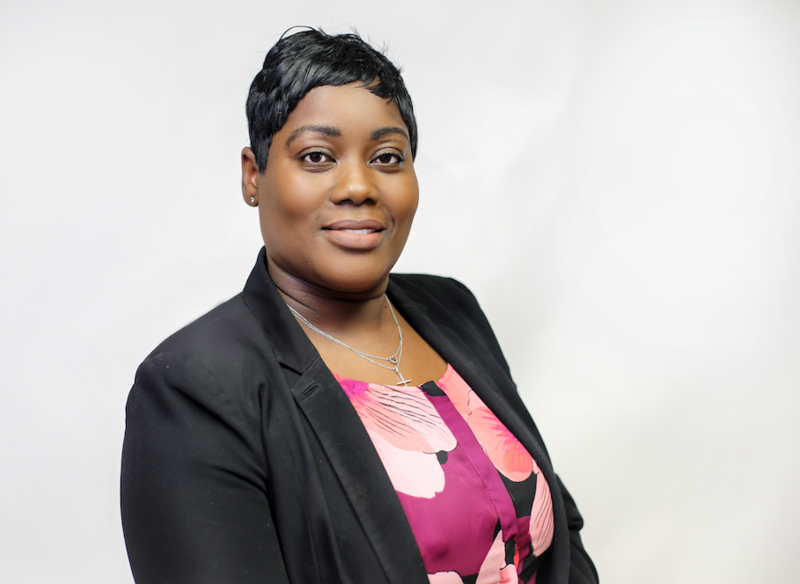 Antaya and her colleagues have learned to select culturally-appropriate vegetables for the pantry they donate to, including okra, collards, and mustard greens for pantries that serve a black population. The farm is centrally located to the Washington Heights and Urbandale neighborhoods in Battle Creek. “One of the things we do is grow food...that we believe is culturally appropriate for the folks around here,” she says. Talking with farmstand customers about how to enjoy hakurei turnips, for example, also broadens their nutritional palates. 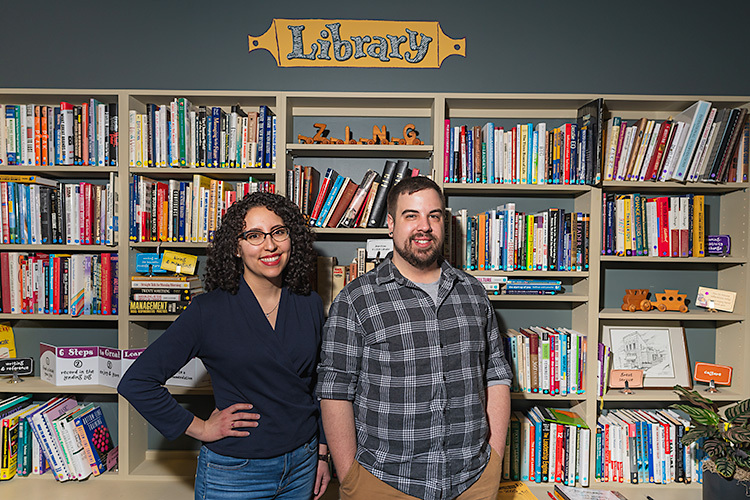 Their library of recipes helps people step out of their food comfort zone and try something new. “By going with what our gut says, we are addressing the food insecurity issue and serving a lot of people,” Antaya says, adding that she’s focusing on sustainability this year, which will come from 365’s ability to supply speciality produce to upscale area restaurants. She’s working now to spread the word about how 365 can be a source for restaurants that want to serve nutritious, hyperlocal fresh foods to customers. Umami Ramen in Battle Creek is a perfect customer for speciality Thai basil that they grow, and Sprout BC helps by reselling bigger, easier-to-grow crops. This story is part of “Michigan Good Food Stories” a series that explores access, equity, and sustainability in Michigan’s thriving food economy. This work is made possible by Michigan Good Food and is supported by the W.K. Kellogg Foundation. Read more in this series. Photos by Adam Bird, unless otherwise noted.